One of the biggest announcements at SOLIDWORKS WORLD this year was the inclusion of SOCIAL COLLABORATION SERVICES (or SCS) at no cost with every seat of SOLIDWORKS on subscription. SCS enables a variety of tools which allow design teams to access their design information anywhere, anytime and from any device. Amongst other things, teams utilizing SCS can create Dashboards to manage their projects, create communities to chat and share ideas, and setup shared 3DDrives to sync files between the cloud and their local hard drive. All of the apps included in SCS are shown in image 1, below. Syncing files between the 3DDrive in the cloud to a local drive on my computer was one of the first things I wanted to try. 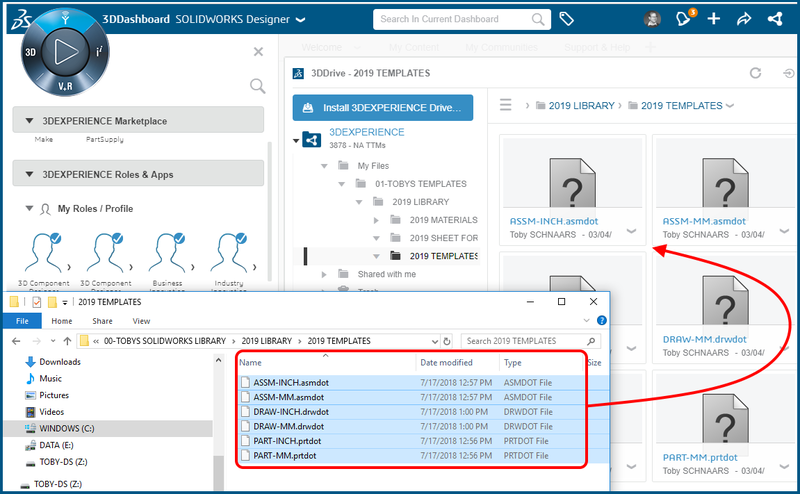 To test this new tool, I am going to share SOLIDWORKS libraries of templates, sheet formats, and materials across my entire design team. This will ensure that my entire team is always working from the same standardized company libraries. With the 3D Experience Platform and SCS, this is as easy as drag & drop. Next we will create a series of folders in our 3DDrive to help organize our libraries, as shown in Image 3. We can always choose to create additional folders in the future. Next we want to ensure that these files are synced between our 3DDrive and our local hard drive. And of course, we want to make sure our co-workers do the same, so that we are all working from the same libraries. To do this, we will install the 3DEXPERIENCE Drive for Windows. After installing we re-boot our computer. 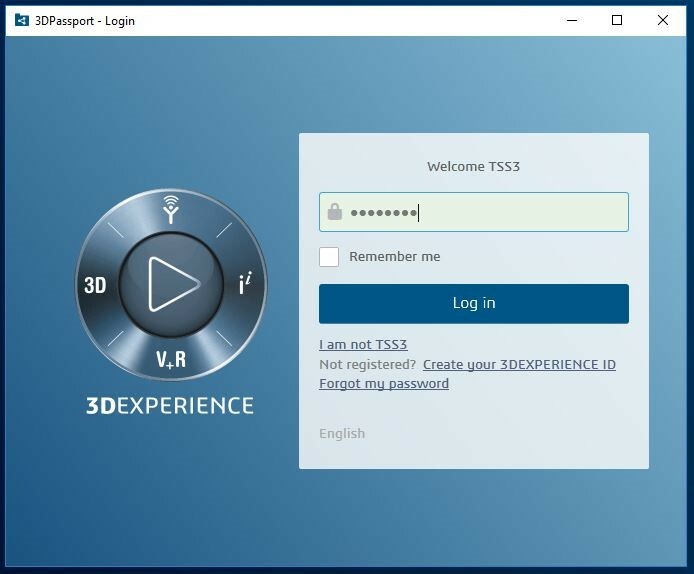 During the next launch of windows, we are asked to login to the 3DEXPERIENCE platform, as shown in image 6, below. This will allow our files to sync between our 3DDrive (online) and the 3DEXPERIENCE Drive for Windows, found on our local hard drive. In image 8, above, we can see that a new part template called PART-METERS has been created and saved in our local drive. And, in image 9, below, we can see that this file has been automatically synced and copied to our cloud based 3DDrive on the 3DEXPERIENCE platform. Our synchronization is working properly. 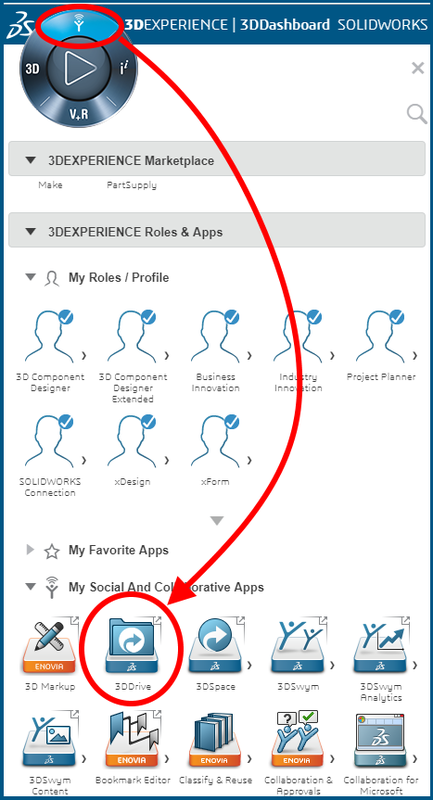 At SOLIDWORKS WORLD 2019 it was announced that all SOLIDWORKS Users will be granted access to a series of 3DEXPERIENCE apps knows as SOCIAL COLLABORATION SERVICES or SCS. One of these apps is the 3DDrive online file storage app. Users can sync the content of their 3DDrive to a local hard drive folder using the 3DEXPERIENCE Drive for Windows. 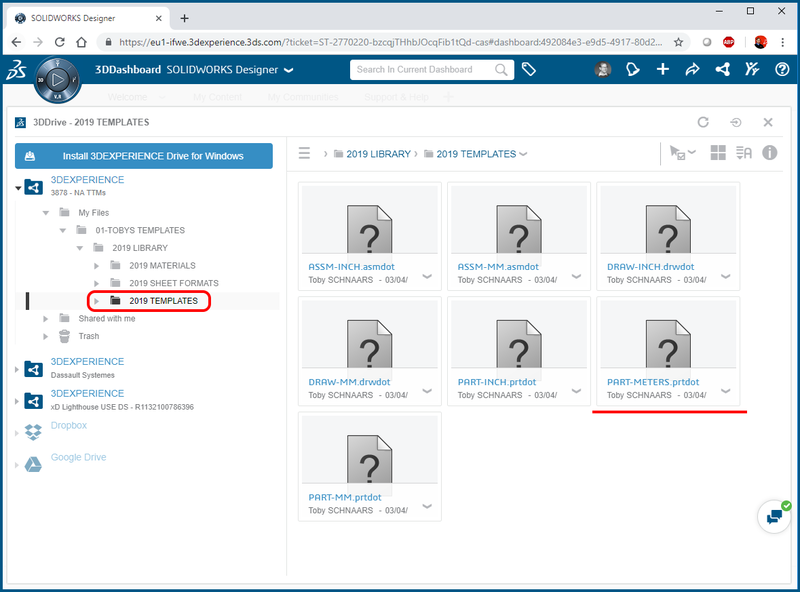 In today’s example we showed how to utilize synchronization to the 3DEXPERIENCE platform to ensure that the entire team has the latest and greatest copies of our company templates and libraries. But this is just the beginning. Once we get our SCS synced and shared with our team, we can share notes, ideas, the project status, and even the design files we are using for the current project. And this information can all be viewed directly in the task pane, in the SOLIDWORKS desktop app. I’m excited to see where SCS takes us!